I’m away from home a considerable part of the year and there is a ‘travel psyche’ that emerges after the first flush of travel excitement. For instance, an event that can be settled with a discussion either at home or away often escalates in the mind, simply because we don’t have the familiar surroundings and tools to mentally cope. I’ve been with the most level-headed people make quite strange decisions and act unusually when traveling. I’m aware that it can hit me at any time and I have strategies to recognize it. I think the hardest thing for me is the constant business that needs to be attended to as I travel. My PA is a great help these days and now everything is double worked… but there are still times when I have to work in unfamiliar environments and territories, like airports and hotel rooms. I lost both my Mum and Dad when I was traveling. If I had have been home I would have mentally been able to deal with it a little differently, but that long plane ride back magnifies the situation and leaves a distance scar. I encountered a situation on a trip to France recently when I was driving a hire car and lost signal from the GPS. I was totally lost in a city I didn’t know, I don’t speak french and I was on a time schedule to catch a special flight because all the others were cancelled due to a plane strike. To be honest I had to summon every ounce of mental strength I had, but my heart was telling me something different. I swore a lot.!!!!! I got myself to the airport with intuition and fell into a heap on the plane with just a few minutes to spare. Walking the streets of New York on my own is like heaven to me, but then again walking down the deserted road here in Dog Canyon is also just as wonderful. Yesterday I was listening to Willie Nelson on my iPhone and walking in time with the music…. heaven…. I cross over the road when I see a car coming toward me, but the stupid driver drove over the yellow line just a few feet from me to scare me. I turned on my heel and pointed at him trying to see the license plate but I’m a bit blind… missed it. But on the other hand there are amazing things that happen when you travel. I meet such fascinating people, see and do exciting things and for me it’s the small things tell the stories. I take nothing for granted and I’ve learned to look at my inner self and be friends with that person in there. I do like being alone, I like thinking my own thoughts and viewing the world from my own eyes. Then I get to share them and create from them. I absolutely treasure my purchases and I share them with the family at home. Travel affords me that. I get to live for a short time in an environment so different to my own. I meet the most amazing people and they are memories that will always be with me. Today I’m of to do radio adverts for the Southern New Mexico Festival of Quilts and then a meeting and presentation to the city and the down town merchants. I have an appearance at a lunch lecture on Messila Comes Alive: A History of Messila and Its Valley, and the Senior Prom….. it’s all go folks. Pam, this quilt looks very similar to ones made by my grandmothers and aunts in Arkansas. 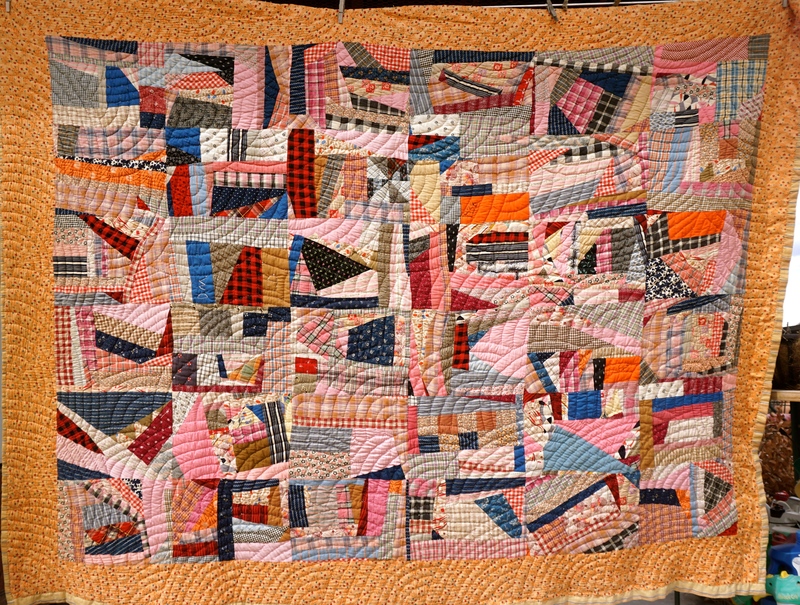 They also used the fan quilting pattern often. Lavern, I will investigate further. I would like the challenge of making one like this too. 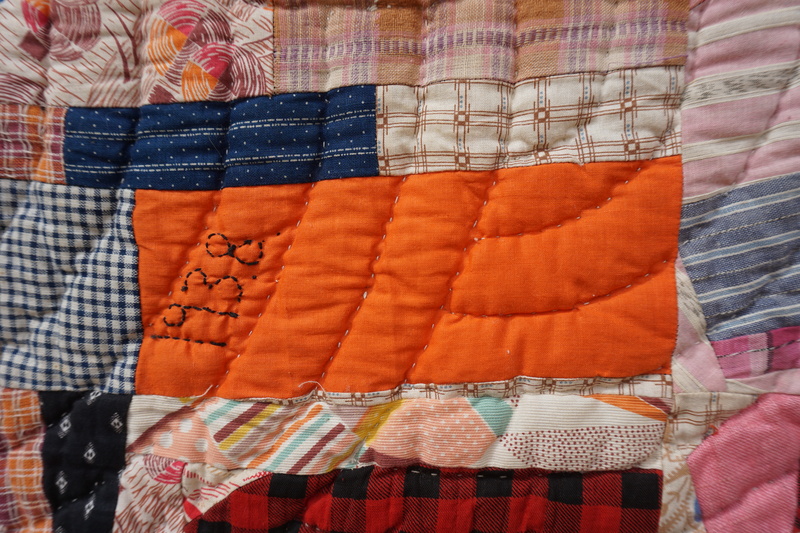 Just love this quilt Pammy. Thanks Carolyn, it sure was a find and I paid $59 for it. I would have pointed at that driver also, but not with my index finger! It takes a special person to remain cool on the outside when encountering stressful situations while traveling… you have had your share of practice, for sure. I get to see Willie Nelson and Allison Krauss in concert this summer… so excited! Previous PostMy interpretation is my art. Next PostThe Southern New Mexico Festival of Quilts.